Source : * As per Final 3rd Advance Estimates (dated 28.02.2019) released by Ministry of Agriculture. IIndia is a vast country and inhabitants of several of its regions have developed specific preference for certain oils largely depending upon the oils available in the region. For example, people in the South and West prefer groundnut oil while those in the East and North use mustard/rapeseed oil. Likewise several pockets in the South have a preference for coconut and sesame oil. Inhabitants of northern plain are basically consumers of fats and therefore prefer Vanaspati, a term used to denote a partially hydrogenated edible oil mixture of oils like palm oil, soyabean, sunflower, ricebran and cottonseed oils. Of late, things have changed. Through modern technological means such as physical refining, bleaching and de-odorization, all oils have been rendered practically colorless, odorless and tasteless and therefore, have become easily interchangeable in the kitchen. Oils such as soyabean oil, cottonseed oil, sunflower oil, ricebran oil, palm oil and its liquid fraction- palmolein which were earlier not known have now entered the kitchen. About 58% of domestic demand of edible oils is met through imports out of which palm oil/palmolein constitutes about 59%. The consumption of refined palmolein (RBD palmolein) as well as its blending with other oils has increased substantially over the years and is used extensively in hotels, restaurants and in preparation of wide varieties of food products. There are two major features, which have significantly contributed to the development of this sector. One was the setting up of the Technology Mission on Oilseeds in 1986 which has been converted into a National Mission on Oilseeds and Oil Palm (NMOOP) in 2014. This gave a thrust to Government's efforts for augmenting the production of oilseeds. 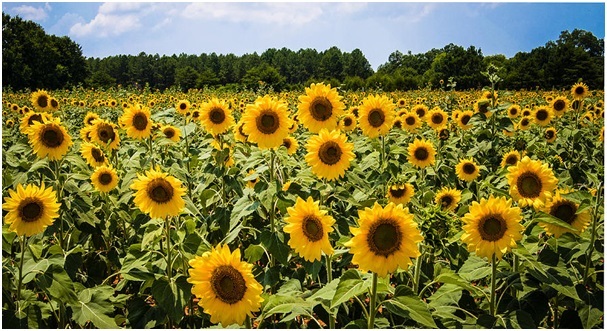 This is evident by the very impressive increase in the production of oilseeds from about 11.3 million tonnes in 1986-87 to 31.50 million tons in 2018-19. 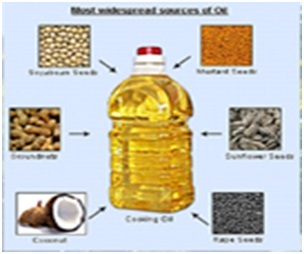 Most of the oilseeds are cultivated on marginal land and are dependent on rainfall and other climatic conditions. The other dominant feature which has had significant impact on the present status of edible oilseeds/oil industry has been the program of liberalization under which the Government's economic policy allowing greater freedom to the open market and encourages healthy competition and self regulation rather than protection and control. Controls and regulations have been relaxed resulting in a highly competitive market dominated by both domestic and multinational players. The country has to rely on imports to meet the gap between demand and supply. Import of edible oil is under Open General License. In order to harmonize the interests of farmers, processors and consumers and at the same time, regulate large import of edible oils to the extent possible, import duty structure on edible oils is reviewed from time to time. W.E. F. 14.06.2018, the import duty on all crude and refined edible oils was raised to 35% and 45% respectively while the import duty on Olive oil was increased to 40%. The import duty on Crude and Refined Palm Oil was revised to 40% and 50% respectively for imports from ASEAN countries and 40% and 45% respectively for imports from Malaysia. In order to ensure availability of edible oil in the country, export of edible oil has been banned w.e.f. 17.03.2008, which was extended from time to time. With effect from 06.02.2015, export of ricebran oil in bulk has been permitted. With effect from 27.03.2017, export of groundnut oil, sesame oil, soyabean oil and maize (corn) oil has been permitted. With effect from 06.04.2018, export of all edible oils except mustard oil was made free without quantitative ceiling; pack size etc, till further orders. Export of mustard oil is permitted in packs of up to 5 Kg with a Minimum Export Price (MEP) of USD 900 per MT. Source:-As notified by Department of Revenue. 1. Vide Notification No. 84/2018-Customs and No. 82/2018-Customs dated 31.12.2018, import duty on Crude and Refined Palm Oils was revised to 40% & 45% respectively for imports from Malaysia and 40% & 50% respectively for import from ASEAN Countries. 2. Vide Notification No. 47/2018-Customs dated 14 th June, 2018, import duty on all Crude and Refined oils, except palm oil and olive oil increased to 35% & 45% respectively, import duty on Olive oil increased to 40%. 3. Vide Notification No. 01/2015-20 dated 06.04.2018 export of all edible oils except Mustard oil made free without quantitative ceiling, pack size etc till further orders. Export of Mustard oil is permitted to be exported in consumer packs of upto 5Kg with a minimum export price of USD 900. 4. Vide Notification No. 29/2018 dated 01.03.2018, customs duty on Crude Palm Oil increased to 44% and customs duty on Refined Palm/Palmolein increased to 54%. 5. With the implementation of FSSAI Act, 2006 w.e.f. 5th August, 2011, the edible oil industries is now governed by FSSAI for issue of license, safety and standard parameters. However, the data monitoring of procurement for the edible oil industries are being administered by the Directorate under Vegetable Oil Products, Production and Availability (VOPPA)(Regulation) Order, 2011. Refinery along with Solvent plant & Oil Mills. Oil Mill & Blended Edible Vegetable Oil. In order to improve and systemize the data management system in the vegetable oil sector, the Directorate of Sugar & Vegetable Oils under Department of Food and Public Distribution has developed a web based platform (evegoils.nic.in) for online submission of inputs by vegetable oil producers on monthly basis. This has helped the Government to take prompt and informed policy decisions for better management of vegetable oil sector. The new system also provides transparency in the data management of the vegetable oil industry as well as Government’s working. The portal also provides window for online registration and submission of monthly production returns.